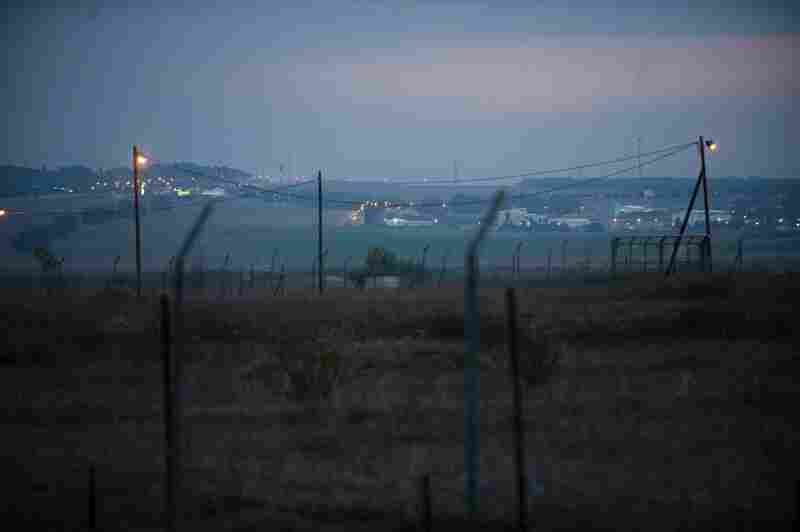 Shell Shock Lingers For Israelis After Gaza War New figures show that the number of rockets fired from the Gaza Strip into nearby Israeli communities has decreased by 90 percent since the end of Israel's Gaza offensive almost a year ago. Yet Israelis with homes close to Gaza say they are still living in fear and suffering the traumatic aftereffects of the bombardment. Rotem Timsit, 16, (left) and Lenoy Shushan, 16, react to a YouTube video showing a play they acted in about life in Sderot during last winter's Israeli offensive in Hamas-controlled Gaza Strip. Although Palestinian rocket fire from Gaza into Israel has decreased 90 percent since the offensive, many of the residents still suffer anxiety from the threat. 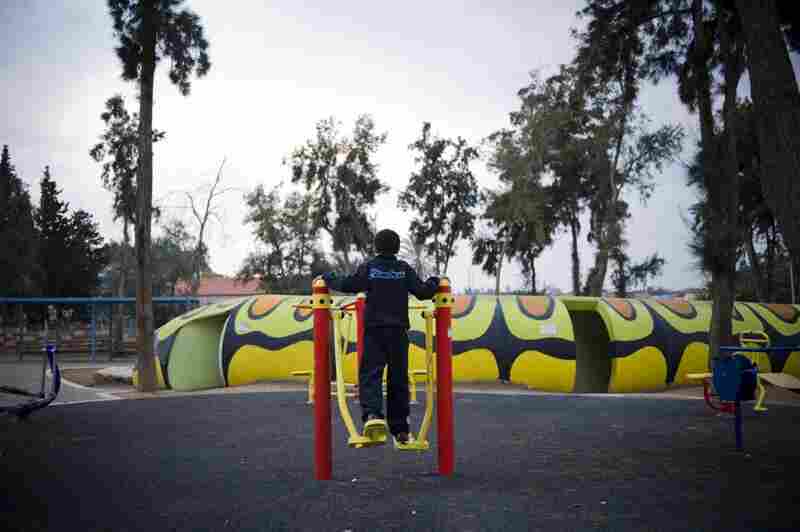 This year the city of Sderot constructed its first "safe" playground — concrete tunnels painted as caterpillars double as bomb shelters. Sderot has been a constant target of Palestinian rocket fire. An Israeli therapist estimates that at least 20 percent of the population suffers from post-traumatic stress disorder. Ramon Dahan is building a bomb shelter in her Sderot home. The Israeli government pays for the construction of private shelters. Dahan's grandson, Aviram Almog, watches as construction workers build a bomb shelter at their house. "We went through a really, really tough period here," says Dahan. 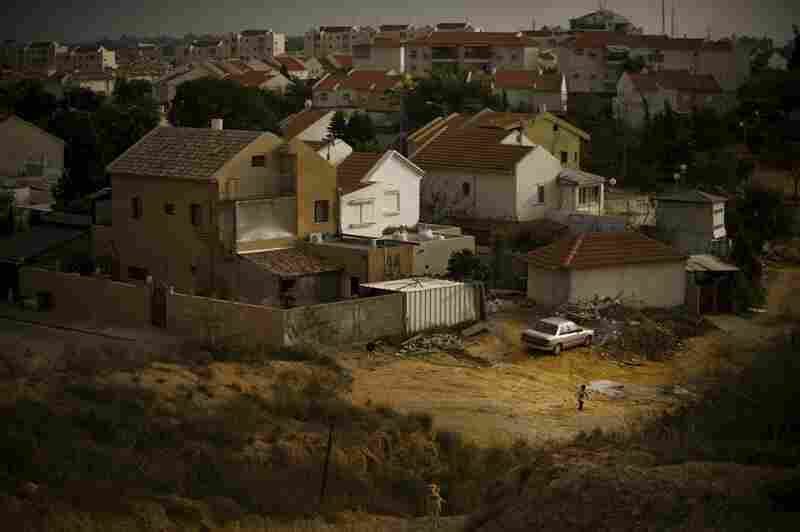 Gaza is seen from an Israeli kibbutz just outside the city of Sderot. 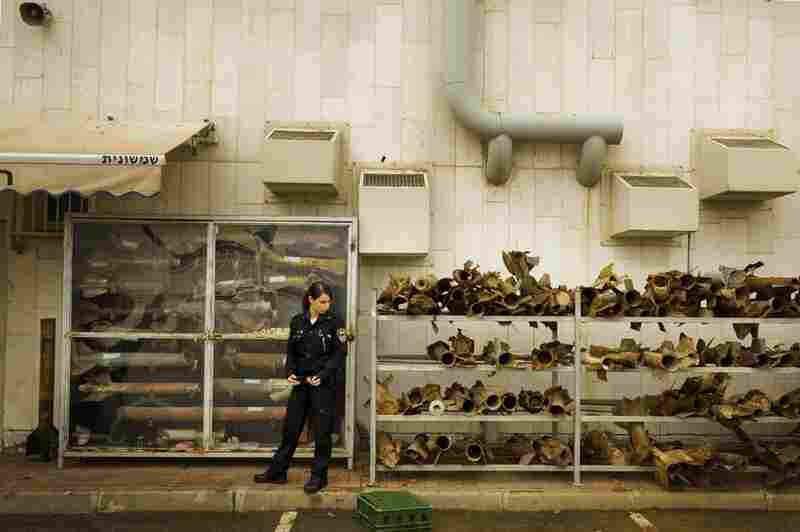 Police officer Tzlil Levi stands in front of the collected remains of rockets fired from Gaza on the city of Sderot. Revital Chai applies makeup to Moriya Sabag (left) while Moriya's mother, Alice Sabag, (far right) and sister Keren Sabag watch. The women were preparing for Alice's son's wedding, which was held in Jerusalem instead of Sderot for fear of rocket fire from Gaza. A girl's dress hangs in preparation for the wedding. Sabag's other son tried to get married in Sderot two years ago, but invited guests did not come fearing the possibility of rocket attacks. "Things are better," says Sabag, "but still not normal." New figures show that the number of rockets fired from the Gaza Strip into nearby Israeli communities has decreased by 90 percent since the end of Israel's Gaza offensive almost one year ago. Yet Israelis with homes close to Gaza say they are still living in fear, and suffering the traumatic aftereffects of the bombardment. They are also continuing to build new bomb shelters, funded by the Israeli government. One such shelter is being constructed at the home of Ramon Dahan, a mother of five. She lives in a two-story house on the outskirts of Sderot, less than a mile from the Gaza border. 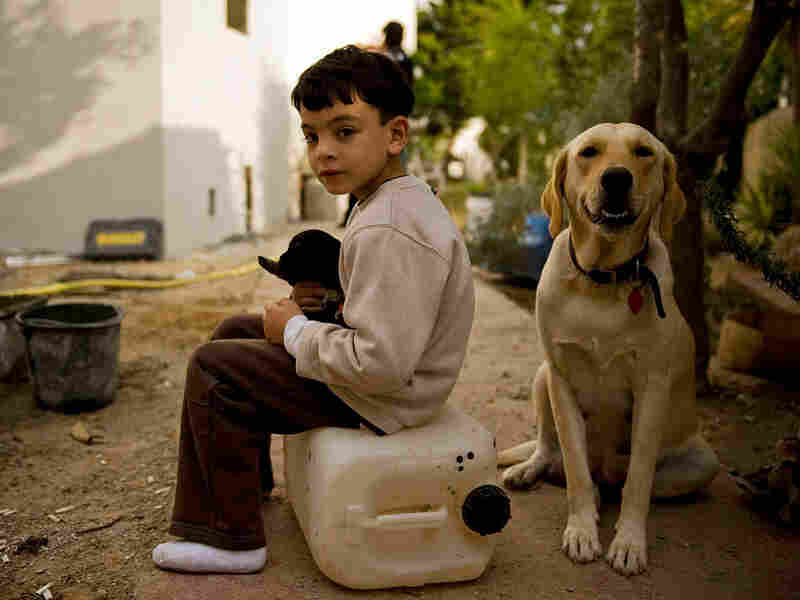 Ramon Dahan's grandson, Aviram Almog, watches as construction workers build a bomb shelter at their house. "We went through a really, really tough period here," says Dahan. Palestinians used to fire rockets into Sderot several times a day, but in the past three weeks there have been no attacks. Dahan says almost every one of her neighbor's homes has been hit. "We went through a really, really tough period here," Dahan says. "Finally, I'm building the shelter. But I don't trust it. 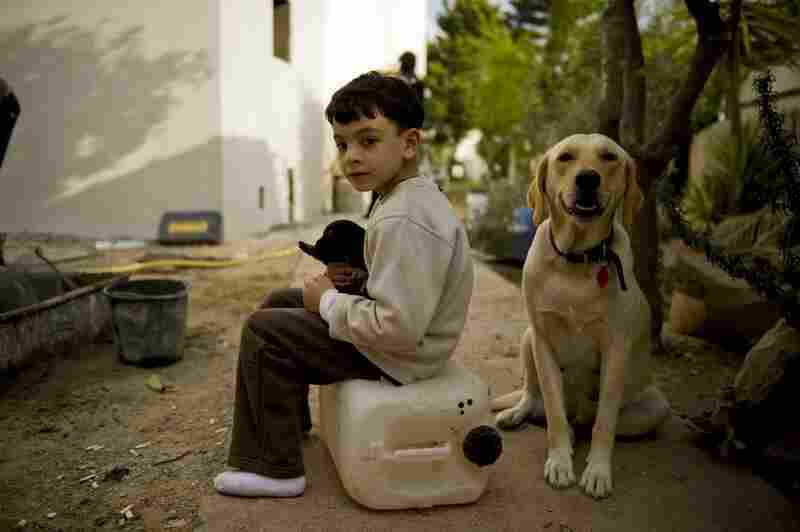 I think in Gaza they are preparing more advanced weapons that the shelter won't protect me from." Dahan says she is seeing a psychiatrist and taking medication in an effort to cope with anxiety and other side effects of living under a relentless bombardment that peaked during the Gaza war. She says she has sent her son away to boarding school; he has been showing signs of trauma, including bed-wetting. 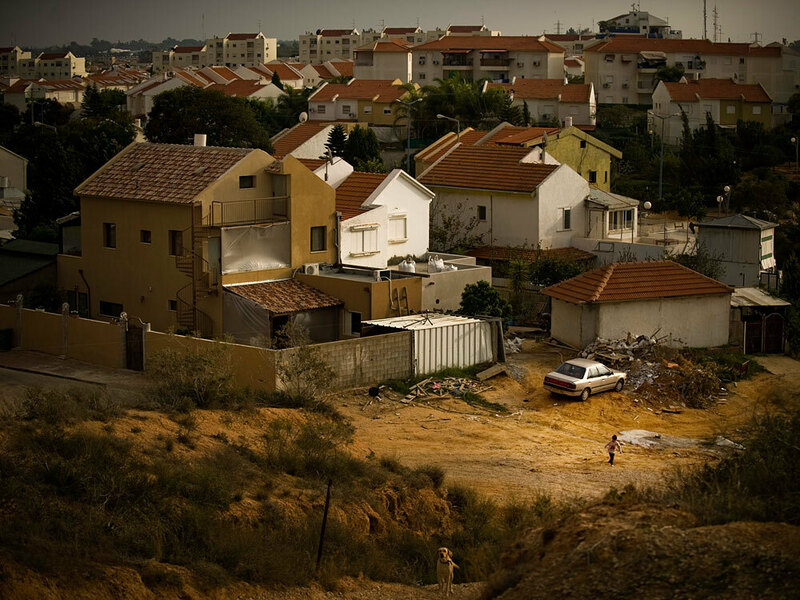 With about 20,000 residents, Sderot looks like a typical suburban haven. The lawns are manicured; the houses seem to belong in an American subdivision. But there are also startling signs of conflict — in one playground, for instance, children chase each other through a tunnel painted to resemble a caterpillar that is, in fact, a bomb shelter in disguise. Judith Bar-Hay is a therapist in the Sderot area who deals exclusively with trauma patients. She says at least 20 percent of the population of the town is now suffering from post-traumatic stress disorder. Life in Sderot is getting better in some ways: Real estate prices have jumped some 30 percent; employment is at an all-time high as businesses move back into town. But Bar-Hay says there are worrying underlying signs that all is not well. There is a high percentage among young people of delinquency, behavioral problems and eating disorders, she says. To try to help teenagers, group therapy was offered at one local high school. Lenoy Shushan and Rotem Timsit, both 16, took part in the program. Lenoy has bright green eyes and long, light brown hair set into perfect curls. Rotem is darker, with a lively smile. Their therapy group ended up making a play about their experiences that debuted in Sderot in October. "The play came about from our own personal stories," said Rotem. "We sat together and talked about what happened to us, to our friends and families." Lenoy says dramatizing their lives was a positive experience. "Of course it helped us a lot. Before I wouldn't talk about the rockets. I'd only say a rocket fell and that's it. But this allowed us to put our experiences onstage." However, Rotem says she still worries about the future. "I don't personally feel things are completely safe now. We still have a rocket here and a rocket there. I think it's the quiet before the storm." Nearby, a mother hugs her son before he gets into a car festooned with white ribbons. It is his wedding day and he is rushing home to get ready before the big event. His mother, Alice Sabag — whose hair is elaborately coiffed into a bun punctured with diamante pins — says it will be a big wedding. But she confides that the wedding will not be in Sderot. "My other son tried to get married here two years ago," she says. "No one came because of the rockets. We've learned our lesson and we are having it in another town."